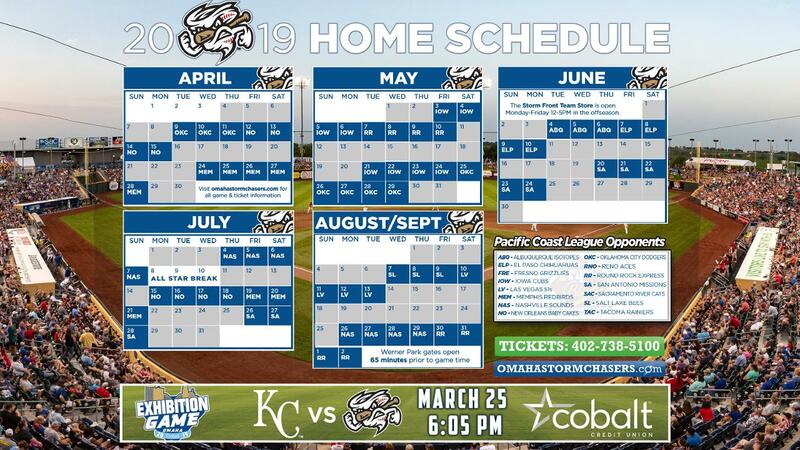 The Omaha Storm Chasers in conjunction with the Pacific Coast League have announced their home dates for the 2019 campaign, which will be the Omaha franchise's 51st season of play. Opening Day at Werner Park is scheduled for Tuesday, April 9, with the Storm Chasers slated to face the Oklahoma City Dodgers. The Omaha franchise's 2019 season currently features 11 Hy-Vee Friday Fireworks dates, as well as the 51st annual Independence Fireworks Spectacular on Thursday, July 4 and Friday, July 5. The schedule is also highlighted by nine Thirsty Thursday dates, and 11 U.S. Bank Family FUNday Sundays. In addition to being home on July 4, the Storm Chasers will also host games at Werner Park on Memorial Day (May 27) and Labor Day (September 2). The 2019 campaign will see divisional realignment in the American Conference, with the Memphis Redbirds and Nashville Sounds joining the Storm Chasers and Iowa Cubs in the Northern Division. The American Southern Division will comprise of Round Rock, Oklahoma City, New Orleans and the San Antonio Missions, who are set to play their first season in the Pacific Coast League in 2019. Fans may purchase ticket packages for the 2019 season by calling the Werner Park Ticket Office at (402) 738-5100. The Storm Chasers continue their seven-game homestand tonight through August 7 at Werner Park against the Las Vegas 51s and Salt Lake Bees. First pitch of this evening's matchup versus Las Vegas is slated for 7:05 p.m. CT.
Tickets are still available for all remaining Storm Chasers contests, and may be purchased at www.omahastormchasers.com/tickets, as well as by calling the Werner Park Ticket Office at (402) 738-5100. To view Ticket Office hours, please click here.